Both featuring in a January loan swap, Youri Tielemans and Adrien Silva have found joy at each other’s respective clubs since the end of the transfer window, flourishing under their new managers. The Belgian has already been linked with a permanent stay at Leicester City, who would have to reportedly pay more than €40m for his services, but there’s a chance they could lower that price. The way they would go about doing that is including Adrien Silva, whose value on the transfer market will be lower than Tielemans’, in the deal. According to France Football, the Portugal international, who struggled to convince Claude Puel to play him during the first half of the season at King Power Stadium, has found ‘unanimous’ support at Monaco, who would like to keep him. Impressing both on and off the pitch, the Leicester midfielder has made nine league appearances for Monaco since the move, which is four more than he managed in all competitions with the Foxes earlier in the campaign. There’s no mention of how much he would cost the principality club, but at 30-year-old with two years left on his contract he will cost far less than a 21-year-old with three left on his. 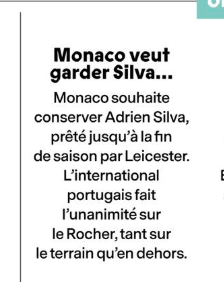 That’s why, if Leicester are smart, a money + Adrien Silva offer would be the best way to go when it comes to landing Tielemans. Someone pass on the message.